Sakai Community DocumentationSakai 19 User Guide (English) Tests and QuizzesHow do I view statistics about a completed assessment? You can view statistical information about student submissions to an assessment, such as average scores and standard deviation. If the assessment has automatically-graded questions, you can also access an Item Analysis page, which gives a quick table overview of the percentages of students who answered each question correctly, and how many students selected each answer option. Select the Published-All option in the View drop-down to view the assessments that have been released to students in your site. Alternatively, you may click on the number of student submissions in the Submitted column to view the submissions. The Statistics page displays information including the number of students who submitted the test, average scores, standard deviation, how many students selected particular responses to each question, and the percentage of students who answered an automatically-graded question correctly. Note: If you have allowed multiple submissions for your assessment, you may have two view options on the Statistics page: either the Highest or Last Submission, or All Submissions. Available view options depend on your assessment settings; for example, if you accepted the highest score for a multiple-submission assessment, you'll see the Highest Submission by default. If you've chosen to accept the average score for all submissions, you'll only be able to view All Submissions on the Statistics page. 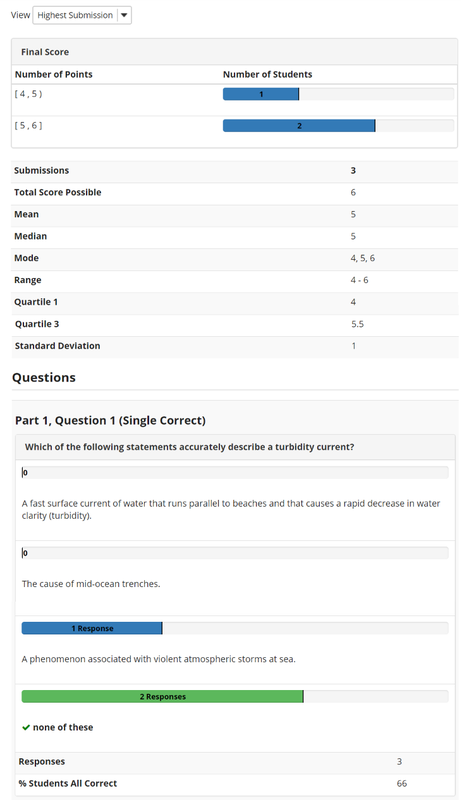 If your assessment has automatically-graded questions, the Item Analysis page gives a quick table overview of the percentages of students who answered each automatically-graded question correctly, how many students selected a particular answer option for each question, and how many of the students who submitted the test provided No Answer to that question. Note: If you have allowed multiple submissions for your assessment, you may have two view options on the Item Analysis page: either the Highest or Last Submission, or All Submissions. Available view options depend on your assessment settings; for example, if you accepted the highest score for a multiple-submission assessment, you'll see the Highest Submission by default. If you've chosen to accept the average score for all submissions, you'll only be able to view All Submissions on the Item Analysis page. Prev: How do I give the same score (e.g. 0) to all students with no submission for an assessment?